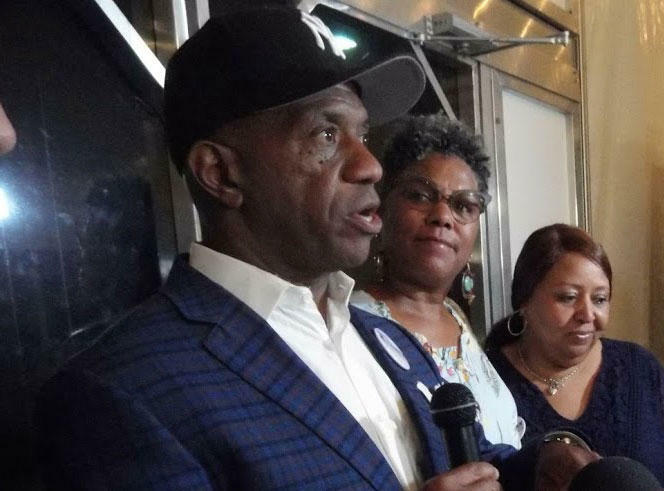 Garry McFadden speaks after winning race for Mecklenburg County Sheriff. The Democratic primary vote effectively makes McFadden sheriff. There's no Republican or other challenger in the fall election. So supporters were ecstatic when the results were clear, chanting "Garry! Garry!" as he his wife Cathy entered a big white party tent on a rooftop at Johnson C. Smith University's Mosaic Village. The crowd included African Americans, whites and Latinos, showing the broad support McFadden had in the race. In a short victory speech, he said he wants to unify the city and county. "I want to change the city to bring unity. I want to change the city to bring inclusiveness. And we're going to have to talk about race. And someone said, 'Is that the job of the sheriff?' Well that's the job of this sheriff!" he said, bringing more cheers. McFadden won with about 52 percent of the vote, to about 28 percent for Ensley, a city human resources manager and former CMPD officer. Carmichael received only about 20 percent of the vote. It was a big defeat for Carmichael, a first-term sheriff who spent most of the campaign defending himself and his policies, including the county's participation in the federal 287(g) program. Under that agreement with federal immigration authorities, the jail identifies prisoners in the U.S. illegally and holds them for possible deportation. "287(g) is going to be history in Charlotte Mecklenburg," McFadden said, to more cheers. "It is going to be an event." That campaign plank was popular among Latinos and other immigrants. Charlottean German de Castro said he thinks McFadden won because he and other activists urged Latino voters to vote early - and to worry about only the sheriff's race. "And you know who won it for him? The single-shot (voters), probably all Hispanics. They only voted for one candidate." McFadden also said he'll bring back in-person jail visits, which Carmichael replaced with video calls. And he says he'll end the use of solitary confinement.